Once in a great while Mr. K gets a hankering for a really good meal. He works down in the south bay and dines frequently at such exciting mall venues as the salad bar at Sizzler, Panda Express (which he claims to hate) and something called Yummy Yummy. So I was very excited when he announced that he wanted to go to Gary Danko, a fine dining establishment located in the city, an event that has become especially rare since he started working in San Jose… We ate there years ago when they opened (read turn-of-the-century) and I remembered liking the fact that they took my Razor scooter to the coat check without a blink of the eye. 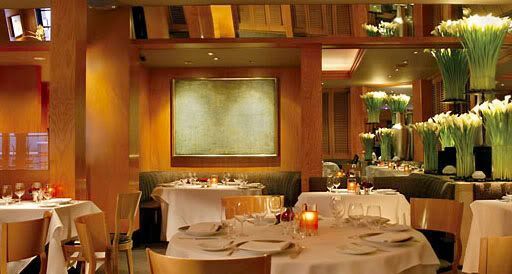 Swanky but not stuffy, although it goes by the name Restaurant Gary Danko, not Gary Danko Restaurant. 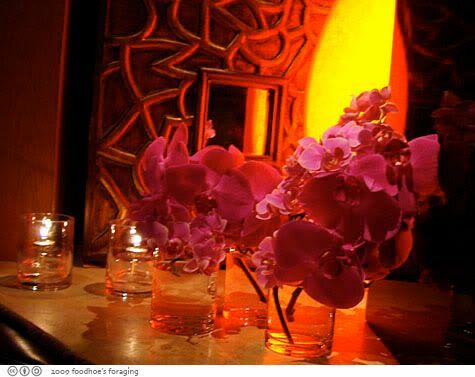 It took quite a bit of scheduling and rescheduling to get us in the door as they are booked solid two months out for Friday and Saturday night dinners, unless you like to eat really late, or want to sit at the bar. No, if you’re going to bust out the bucks, we wanted to sit in the restaurant proper. The menu has many choices where you can either have a 5 course tasting menu or create the menu you want, in any order you specify. 3 Courses $66 :: 4 Courses $83 :: 5 Courses $98 :: Tasting Menu $98 :: Wine Pairing, an additional $65. We each ordered 4 courses with a few glasses of wine. The staff is awesome and it seemed like someone was there whenever I turned my head! We started with an amuse bouche of silky smooth scallop mousseline that had an ethereal frothy but firm texture that resembled… a scallop. It was a small thing that we gobbled up in a couple of bites. 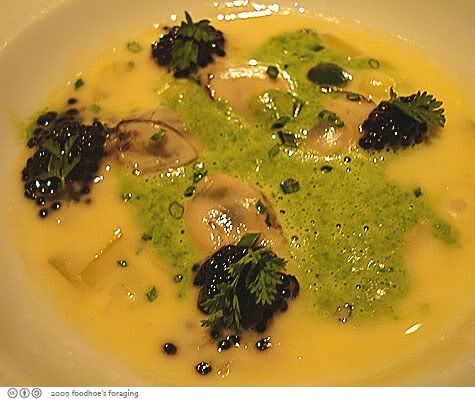 Glazed Oysters with Osetra Caviar, Salsify and Lettuce Cream. I love oysters, you know I do…. the tiny little mollusks were swimming in buttery sauces along with mounds of briny caviar. 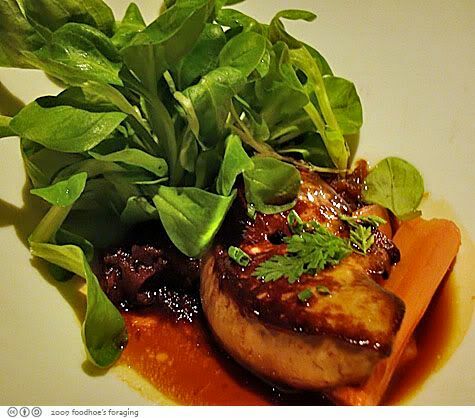 Seared Sonoma Foie Gras with caramelized red onions and rhubarb, served with mache. Mr. K’s coworker ChrisN had impressed upon him that he must get this dish. 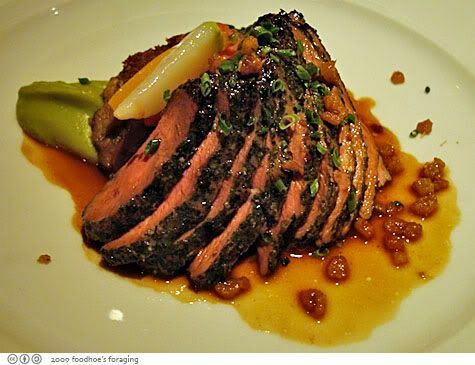 Our server recommended that we pair this with a sauterne, which really did set off an amazing chain reaction in our tastebuds when you took a sip after a bite of the rich fatty liver. We giggled trying to say it, fwa graa I know that I sounded just like Daffy Duck (phowaa gwaa) which made it all the worse…. but yeah, this dish was fantastic. It was like eating butter but the seared exterior added just the right amount of crisped chewy texture as you bit into it, filling your mouth with a rich burst of flavor. 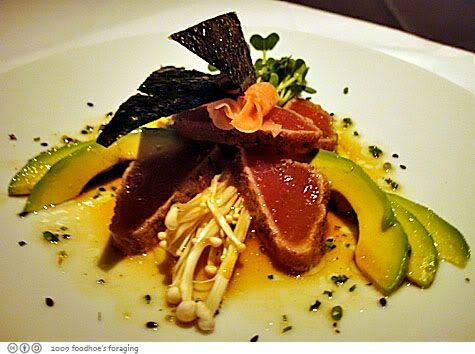 The Seared Ahi Tuna was artistically arranged with dried Nori cut into the shape of butterfly wings fancifully stuck onto a chubby wormlike body made from rolled up pickled ginger. This was served over Enoki Mushrooms, slices of avocado and daikon sprouts and drizzled with a delicate Lemon Soy Dressing. Lemon Pepper Duck Breast with duck hash, asparagus puree and sauteed greens. This was a generous serving and the meat was unbelievably tender and succulent and served with a densely flavored savory sauce that really had us smacking our lips. We savored every bite… The asparagus puree was interesting, slightly bland with a fluffy texture that didn’t distract or add much besides a pleasing green swatch on the plate. The next two courses were not quite as riveting to our taste buds. 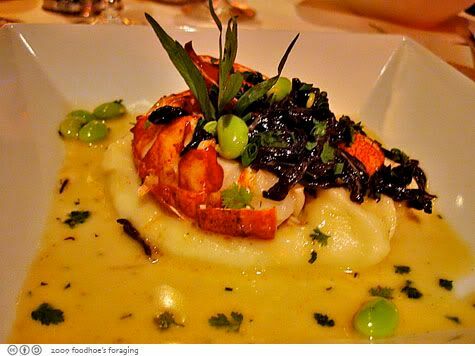 Roast Maine Lobster with potato puree black trumpet mushrooms edamame and tarragon. 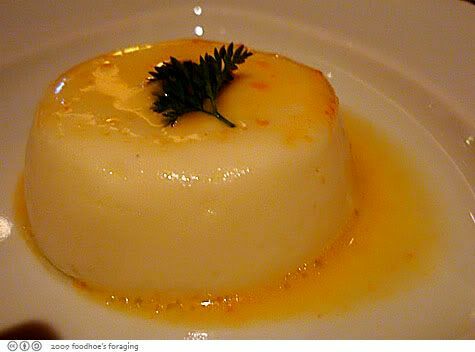 The tail was small but provided a few meaty bites, and the potato puree was delicious and swimming in a pool of a rich creamy sauce that tasted of tarragon. 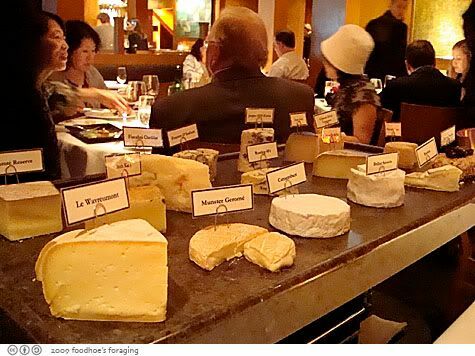 It was hard to decide when the slate covered cheese cart rollled up with around 20 or so pungent offerings, but oddly enough, it was this course that Mr. K and I had found to be so memorable from our first visit. I remembered how the aged and oozey cheeses were so pungent that the fumes felt like flames burning our nostrils, but nothing so dramatic happened this time. 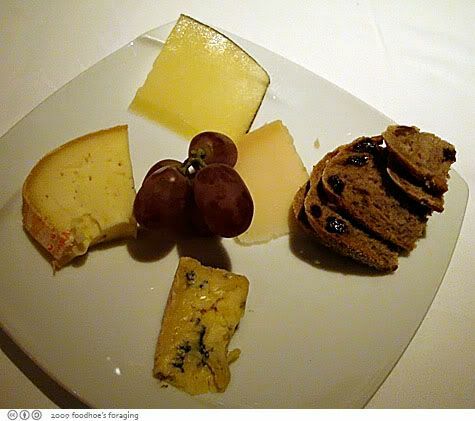 Our server tucked in an extra little sliver of Midnight Moon, a fine Dutch gouda for us. Dense and chewy, aged for at least one year, during which time it develops a lovely brown butter flavor with intense caramel undertones; Pecorino Sardo: sheep milk from off the coast of Italy, made from raw milk in the style of centuries and is between 4 and 12 months by the time it arrives in the US. The sheeps dine on wild flowers, grasses, herbs and flora sweeten the milk with a very distinctive Island flavor; Roaring 40’s: Tasmanian blue cheese made from pasteurized cows milk – where cows dine on a diverse plant life that offers up flavor unlike anything else in the world. We loved its pungent salty flavor, and the delectable crunchy crystals within the creamy rich veins; Le Wavreumont: produced from organic, raw cow’s milk and the color varies with seasons – pale straw in winter and orangey yellow in spring when the cows return to the lush pastures of the Ardennes. Nice and nutty, creamy created by trappist monks. 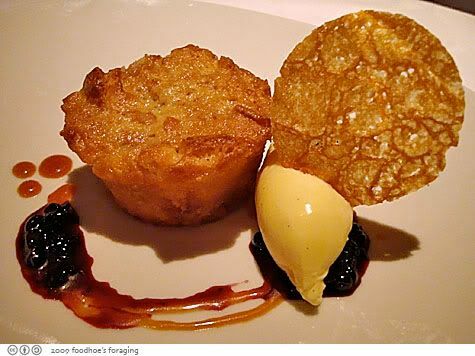 We had to wait a bit for the dessert but both really enjoyed the Warm Louisiana Butter Cake with huckleberry compote and vanilla ice cream. It looked a little bit like a muffin that was spongey soft but at times dense and chewy where you almost expect it to flake like a croissant. It was deliciously addictive, especially when dragged through the caramel and fruit compote. The only drawback for the evening was that I had to wait in line for quite a while for the loo because one of the two was out of commission. The line was about 3 deep when I got there and we stood awkwardly in the cramped space between a storage area and private dining room. 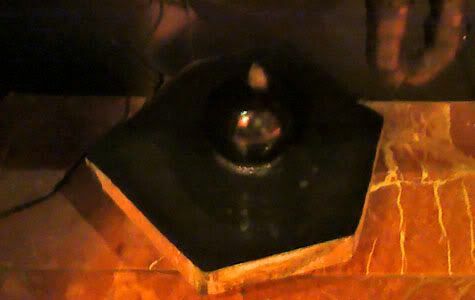 But it was worth the wait, the room was well appointed and opulent with the soothing gurgle of a fountain beneath the sink, and even sported an electric shoe shine device. Along with the receipt, we were presented with a small treat to enjoy with coffee the next morning. 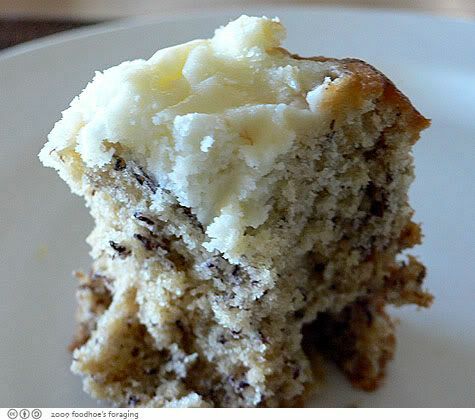 It was a delicious little banana cake with cream cheese frosting. I almost finished it before I remembered to take a photo… What a fine touch, it really reinforces the attention to detail! Yes it was expensive and yes it was tricky to get reservations, but each bite was memorable and delicious. Mr. K said that he wanted to lick the plate clean for each and every dish. What a meal! Not a bad price either considering all the wonderful dishes you get. That duck looks SO juicy and HUGE! I bet my honey would love it! We’re planning on taking his parents there in a couple of months when they come up. I can’t wait! Cookies last blog post..I Finally Made Lasagna Rolls! Oooh, that looked like such an elegant and relaxing dinner. That duck dish looked huge! 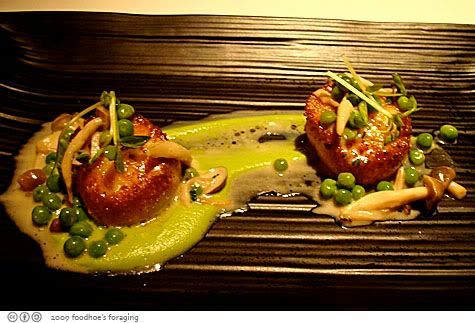 And I’m with you on scallops … love them seared! grace, I agree that all restaurants should give out treats! Cookie, yes the duck was the best. you guys have to get the duck! single guy, that was a good one. I perfect day for the evening, just lovely and full of pleasure. 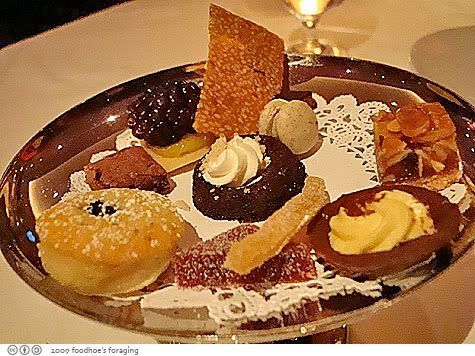 Was that macaon on the dessert platter? The lobster made me weak in the knees! And the cheese to bring down the house! Ahhhhh…. yumsicle. Sigh, that is utter perfection Foodhoe! The shoe shine in the bathroom is the best touch of all! 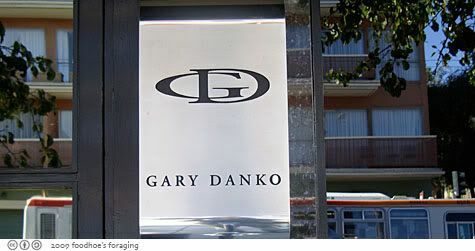 I went to Gary Danko once (also, eons ago) and before I had a blog. 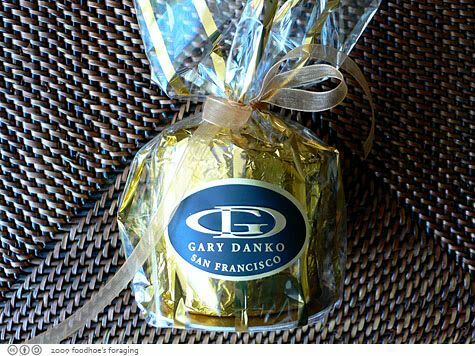 Thus, I always hoped someone would capture Gary Danko again in their food blog so I could relive the experience. And you definitely did! I remember the service was so good, the servers would come and refill my glass before I even put it back down on the table! They do need to get another bathroom though so there is no line! 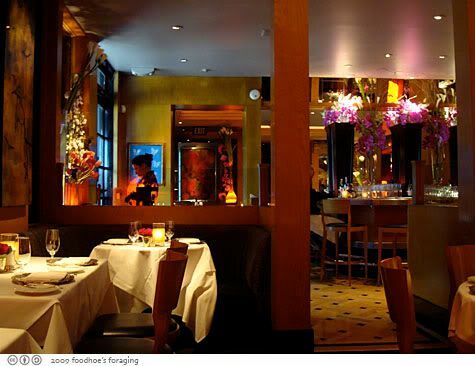 taste tests, it is excellent – go for your next celebration dinner! PE, seeing that shoe shine thing was really a first! I’m always looking for good tastes and this blog is an inspiration.